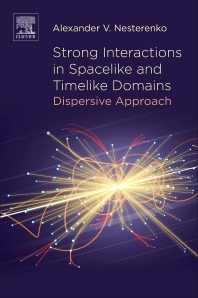 Strong Interactions in Spacelike and Timelike Domains: Dispersive Approach provides the theoretical basis for the description of the strong interactions in the spacelike and timelike domains. The book primarily focuses on the hadronic vacuum polarization function, R-ratio of electron-positron annihilation into hadrons, and the Adler function, which govern a variety of the strong interaction processes at various energy scales. Specifically, the book presents the essentials of the dispersion relations for these functions, recaps their perturbative calculation, and delineates the dispersively improved perturbation theory. The book also elucidates the peculiarities of the continuation of the spacelike perturbative results into the timelike domain, which is indispensable for the studies of electron-positron annihilation into hadrons and the related processes. Dr. Alexander V. Nesterenko is a senior researcher at the Bogoliubov Laboratory of Theoretical Physics, Joint Institute for Nuclear Research, Dubna, Russian Federation. He graduated with honors from Moscow State University where he obtained a PhD in theoretical physics. He was a Post-Doctoral researcher at the Ecole Polytechnique, France, and University of Valencia, Spain. He actively works in the area of the theoretical particle physics and is a referee for several APS and IOP journals. An experienced lecturer in Quantum Field Theory and Quantum Chromodynamics, he has published two textbooks based on his lecture course.